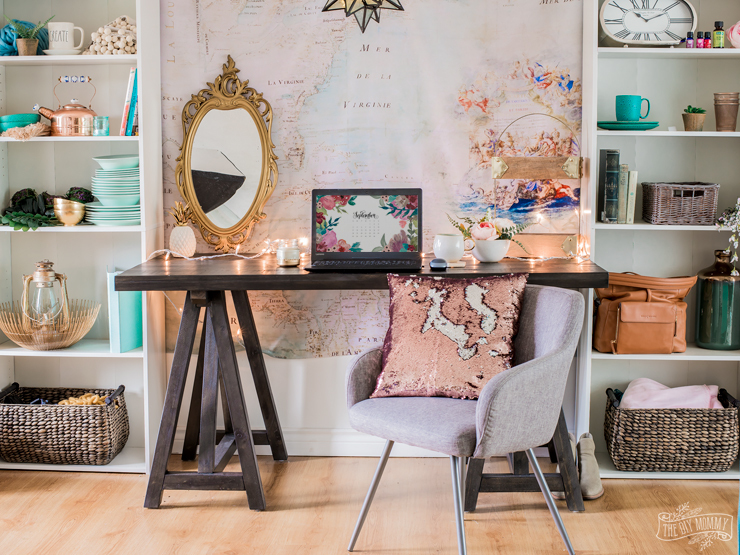 How to Style Your Home Office 3 Ways: Glam, Minimal or Cozy! 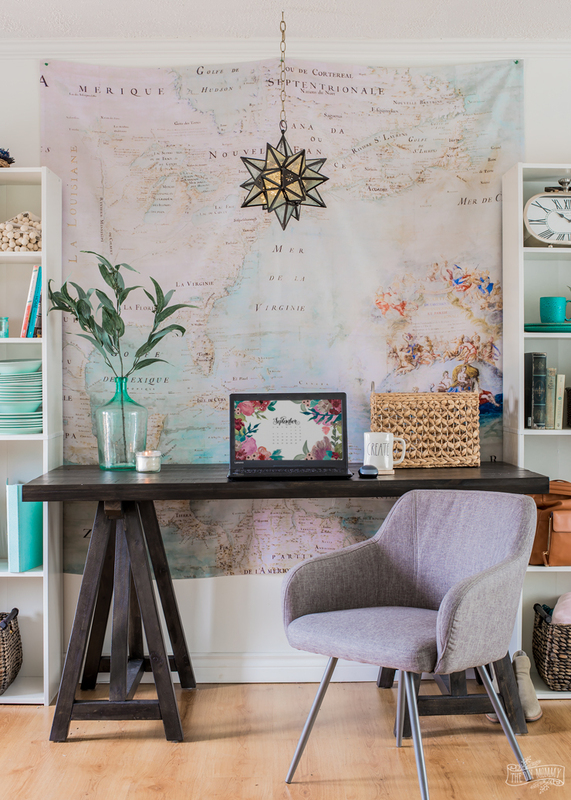 Whether your decor style is glam, minimal or cozy, learn how to style your home office so that it suits your taste and helps you be more productive this Fall! September is here, and with it comes the return to routine as the kids head back to school. 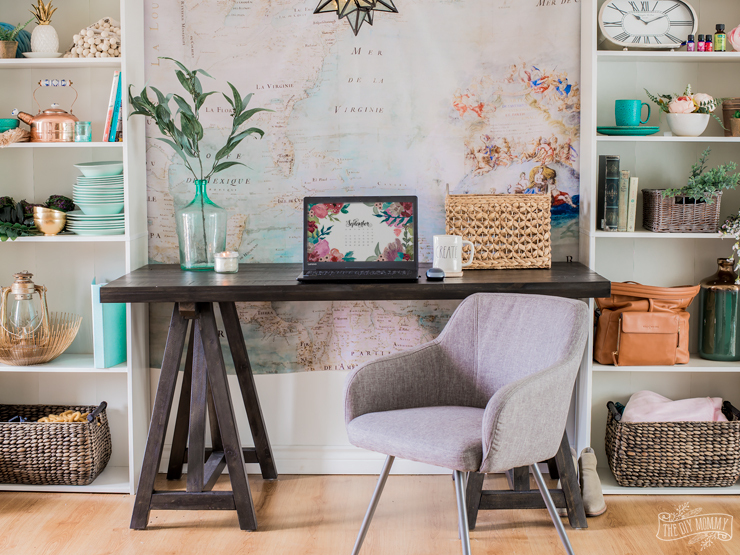 It’s a great time to clean and organize your home office or homework area so that it’s ready for you – or your kids! – to get some work done. 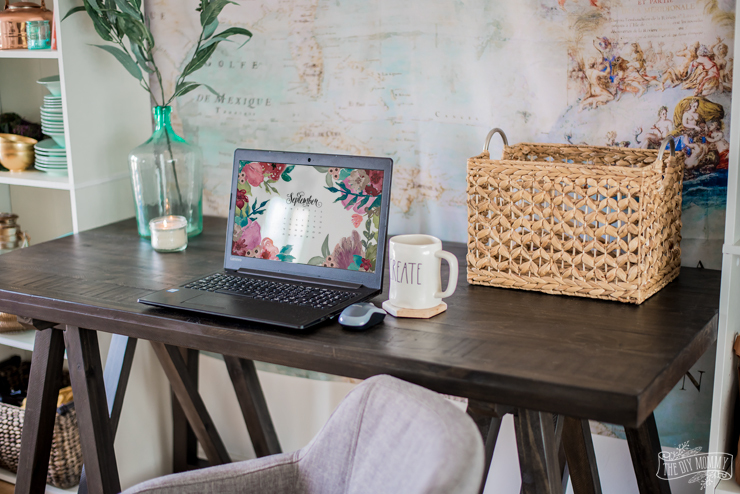 I had a chance to tidy and play with my desk area in my work studio, and today I want to show you how I styled it three different ways. 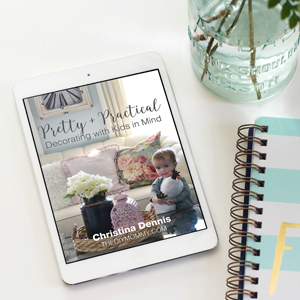 I’m hoping one of these styles makes you smile and gives you some inspiration on how you can decorate your own home office this season! Do you love shiny textures, feminine accents, and brilliant metallics? 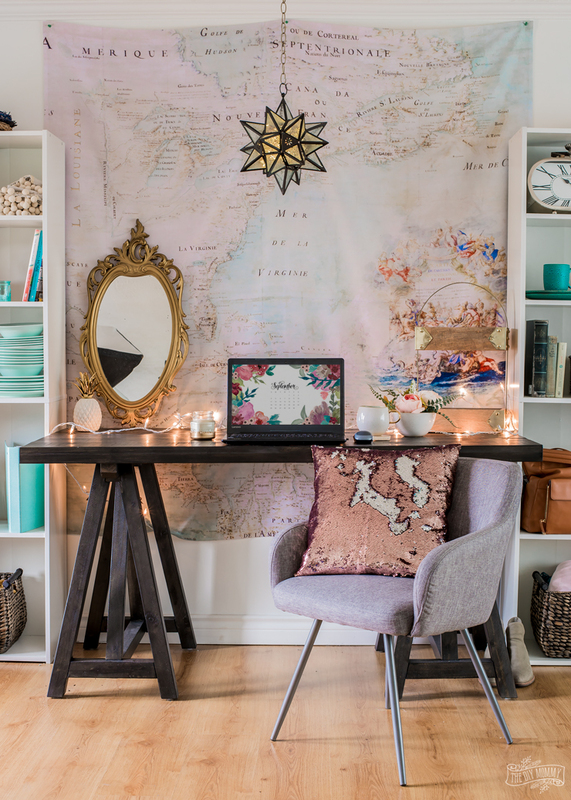 You might like this glam home office styling! 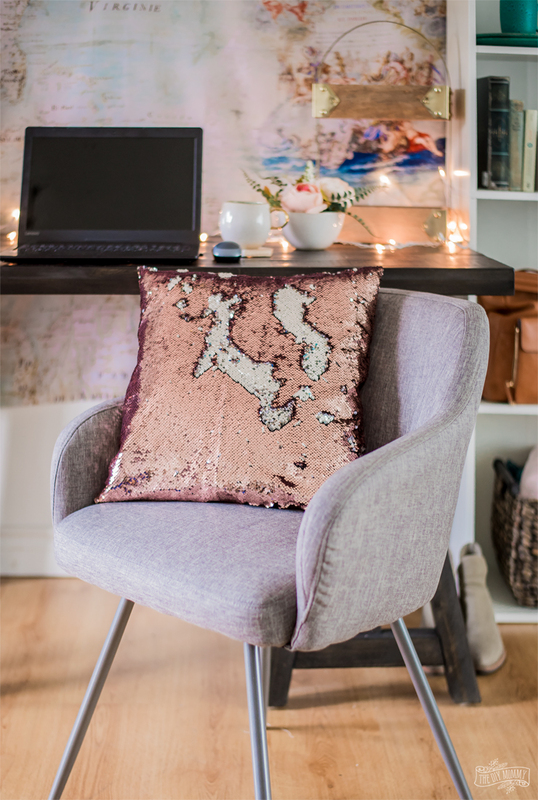 I’ve added a DIY mermaid sequin pillow in gold and silver to my Soft Modern Chair from The Brick to give it some sparkle. 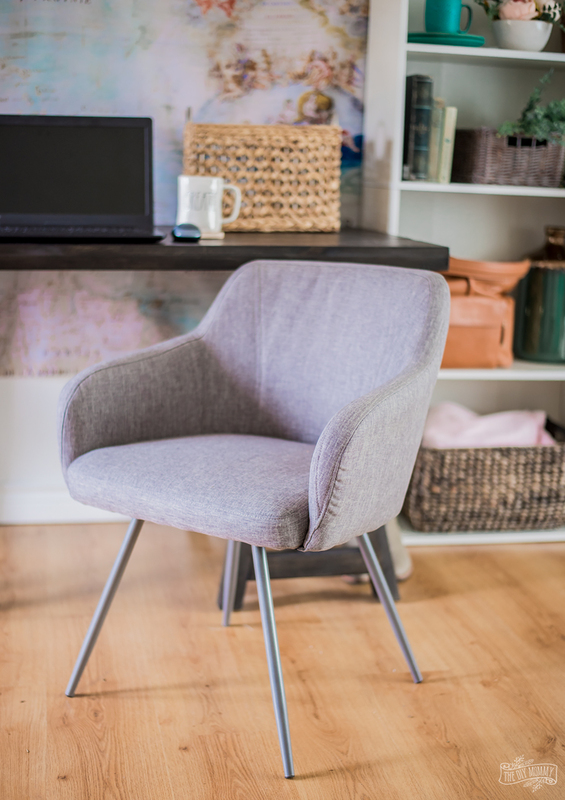 I’ve been loving this chair in my studio office because not only is it comfy, but its simple lines and neutral grey colour make it so easy to suit any style! 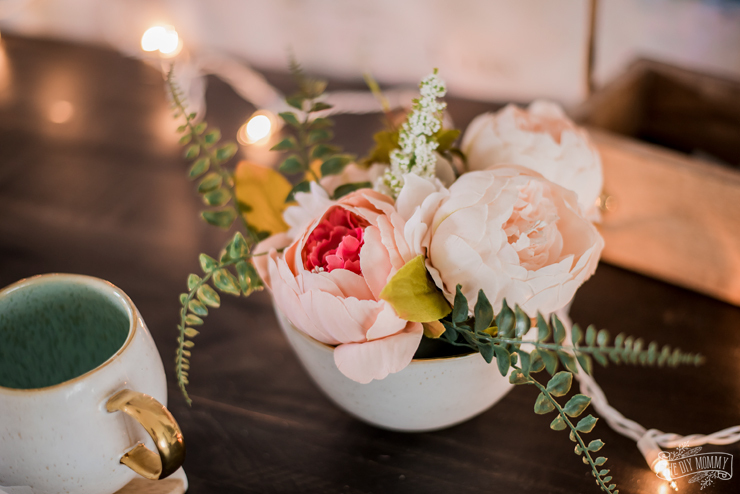 A small bowl of faux peonies in a soft pink adds more glamour to this work area, and so do lots of twinkle lights and gold coloured accessories. Adding shimmer, sparkle, florals and gold accents to my Calistoga Writing Desk from The Brick gives it a glamorous look on a budget. I also find this desk very versatile with its rich wood tone and simple lines. The finish has held up wonderfully so far, and I’m still loving those gorgeous trestle legs! Do you love smooth textures, modern accents, and neutral colours? You might like this minimal home office styling! 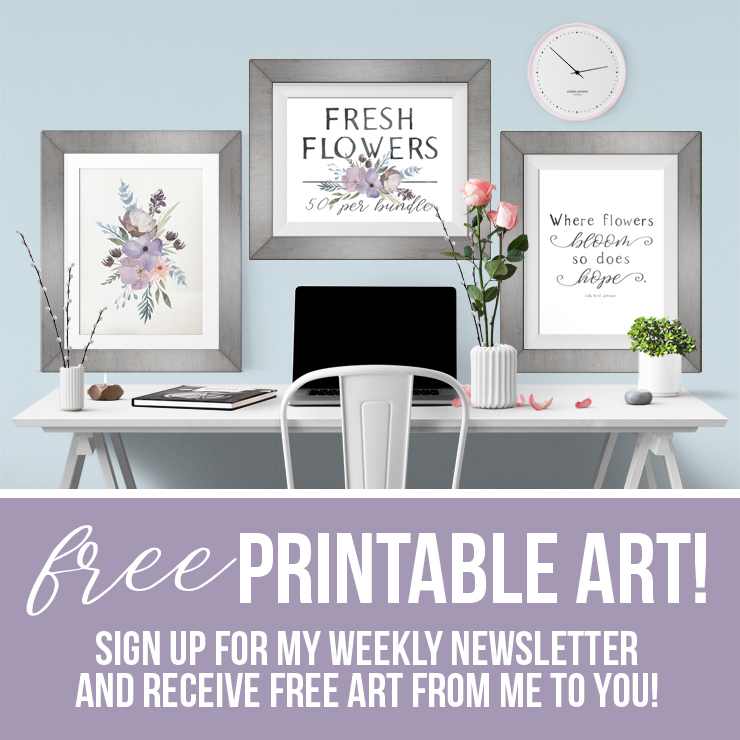 If you don’t like a lot of accessories on your desk, this one’s for you! I kept my office chair free of any accessories for the ultimate function and clean look. 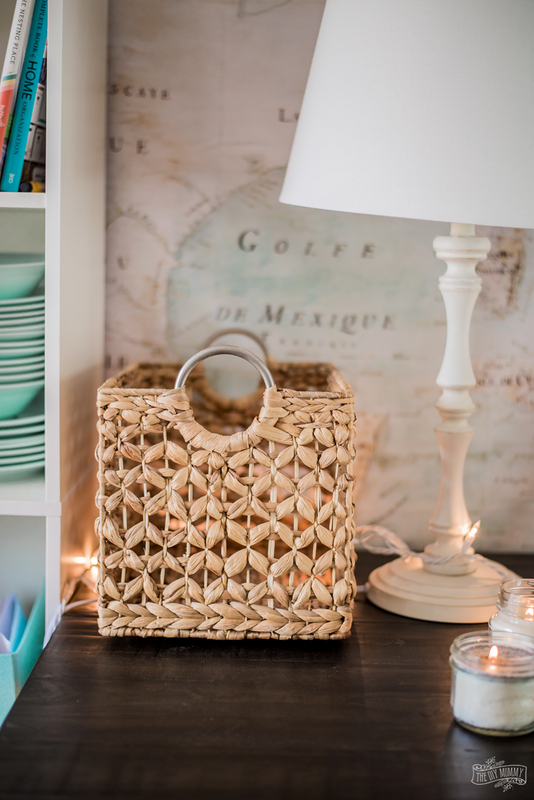 One rattan basket will hide all of my office accessories like pens, pencils and books. I found a set of three of these baskets in-store at The Brick, and I use them everywhere. The beautiful accessories I find at The Brick always pleasantly surprise me, and there’s something different in every store! 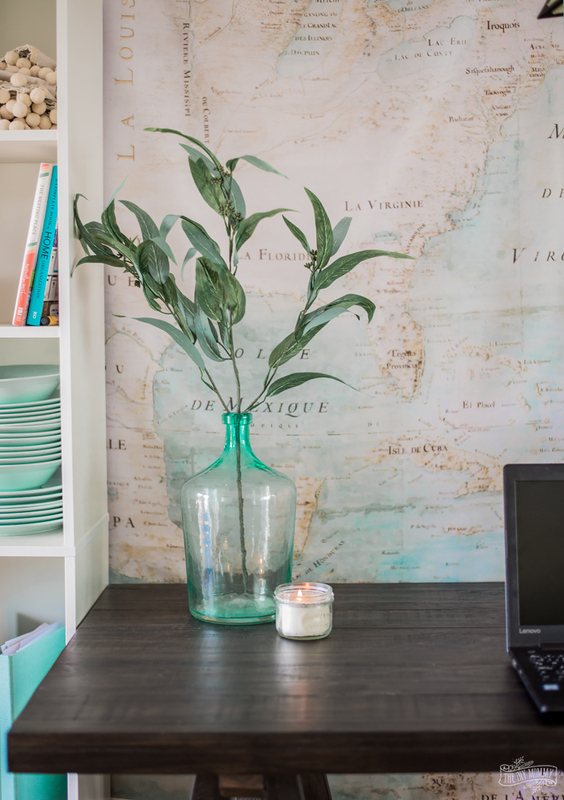 I kept the accessories on the desk to a minimum too by using one small candle and a simple vase with faux eucalyptus. Paring down on accessories and using simple, sculptural items gives my desk a minimal look on a budget. 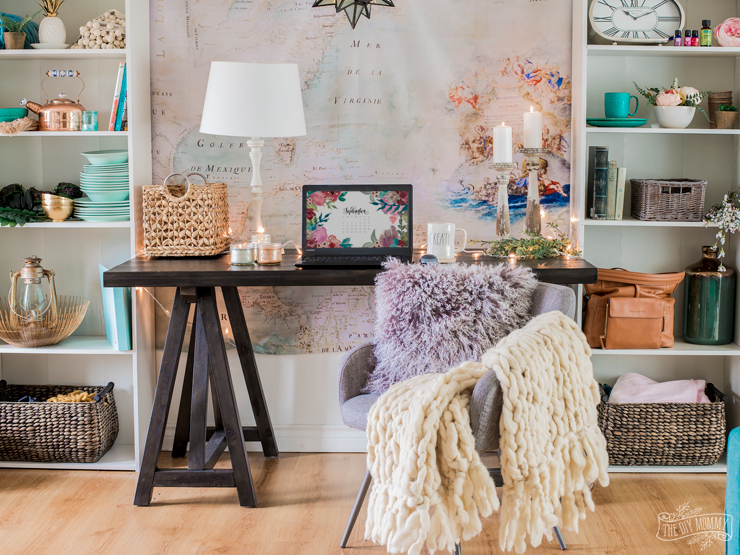 Do you love fuzzy textures, rustic accents, and warm colours? 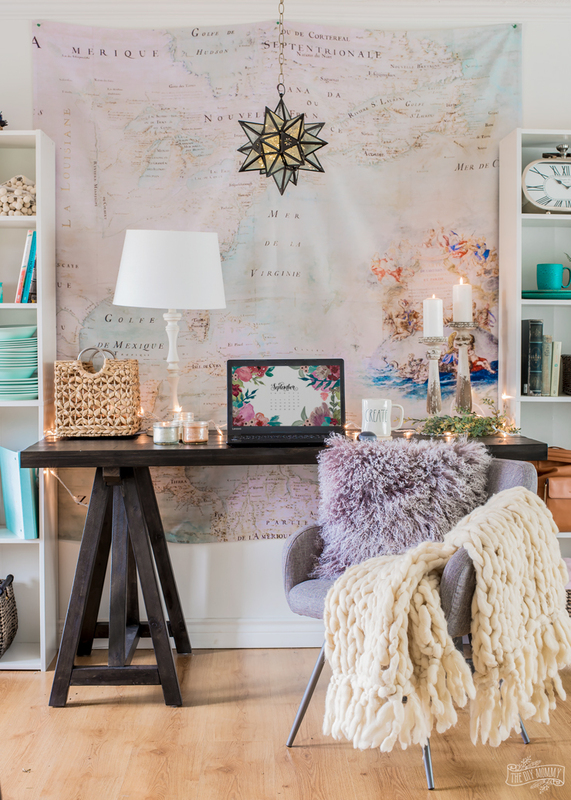 You might like this cozy home office styling that’s perfect for Fall & Winter! 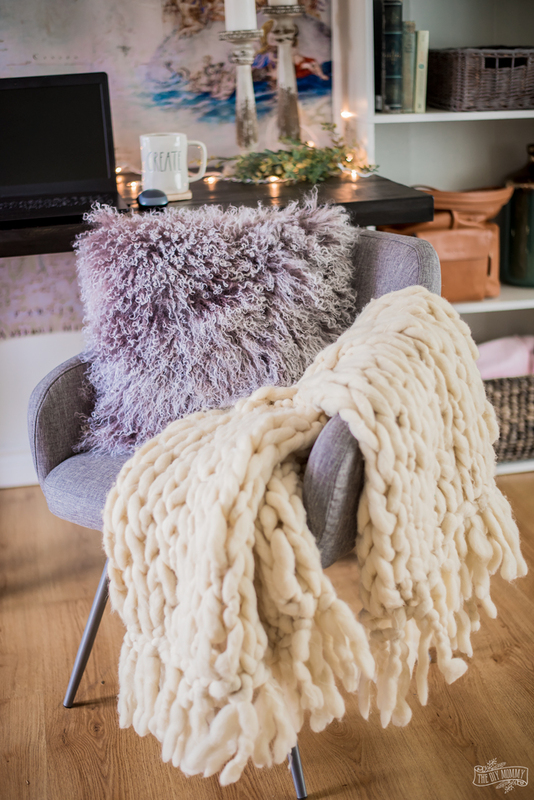 To make my office chair extra toasty, I piled on a DIY arm knit blanket and my favourite Mongolian Sheepskin Dip Dye Pillow from The Brick. I use these versatile pillows in so many spaces (I also love the white version for the same reason)! They’re also SO soft and comfy. Adding lots of twinkle lights and a trio of homemade mason jar soy candles ups the cozy factor in this space. I’m using this lovely basket from The Brick again in this version of my office for both storage and texture. Lots of texture is essential for a cozy and warm feeling room! I’m also using my Megan White Table Lamp from The Brick for added task lighting and warmth. I love it’s cottage style look and neutral colour. 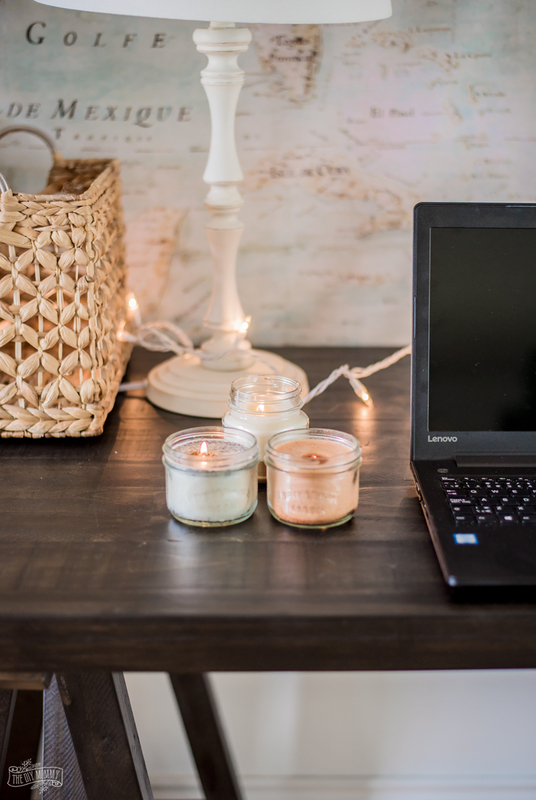 Layering accessories, adding lots of warm lighting via candles, twinkle lights, and a lamp gives my desk a cozy look on a budget. 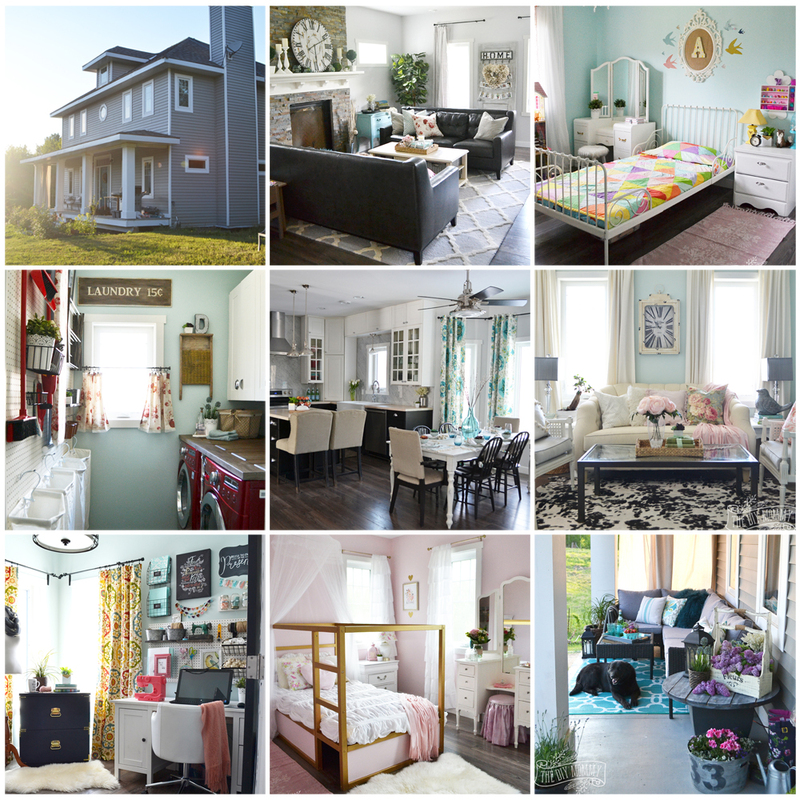 Now tell me: Which is YOUR favourite home office style? Can you guess my favourite look that I’m keeping for the season? Great post. I love all three ways, how fun to see the changes. I love everything right from the map like wallpaper behind the system, lights and the basket. 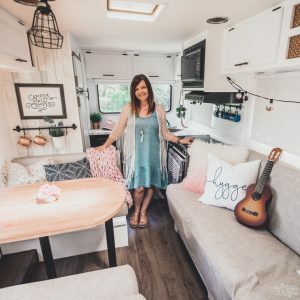 Yes, it is cosy, minimalistic and most of all, clean:) Love it, Christina!